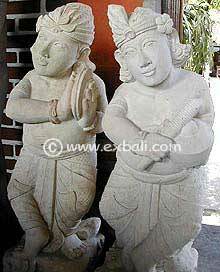 BALI STONE STATUES: The geography of Bali is mountainous , interspersed with terraced rice paddies on ridges and the plains. Being of volcanic origin the island is abundant with quarry sites giving the local stone carvers a variety of stone materials to choose from. Styles vary from village to village with many intricate designs for local temples and places of worship. 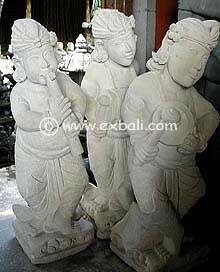 More contemporary forms of stone carving are widespread, finished for both indoor and outdoor use.